When I saw your GSD contest online I couldn't help but enter our beautiful German Shepherd and share his heartwarming story. After years of abandonment, locked in a second floor apartment, just left behind to guard and protect this property with just a fifty pound bag of dry food left opened and a toilet bowl to drink from. Finally one day this beautiful German Shepherd was able to push the glass out of the window and jump out. His owner had no use for him except to watch over his property while he would be away driving trucks for weeks at a time. Covered in lacerations from the broken glass and a broken paw, this was just a small price to pay for his new life yet to come! After three weeks in a foster home Diesel was adopted by myself. After speaking with animal control I knew my home would be best suited for him. They needed some who would be home all the time to help this German Shepherd recover from his injuries and help him feel secure that he would not be left alone and abandoned again. Only working limited hours from my home I knew I could give him the life he deserved. The day I brought Diesel home my heart was filled with joy in the idea I was rescuing this beautiful dog but soon I would learn that really that day he would be rescuing me! He has completed my family more than I ever thought possible. It took about two years for Diesel to really let myself and my family into his heart. After a lot of training classes and constant love, Diesel is finally living the life he deserves. In the winter he loves to cuddle with my five year old son in front of the fire every night. When weather permits he loves to hike in the woods in our backyard, hang at our campsite, play at the beach, or just sit on the porch watching over his family. I could not imagine our life without him and I am so grateful he has learned to trust again! 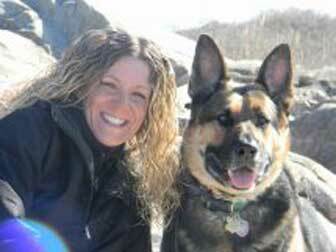 Thank you in considering Diesel for your GSD contest, sharing his story is very important to me. I can only hope more people consider rescuing a German Shepherd.